Talks continue over 12 nuns kidnapped on 6 December. The Syrian government is reportedly negotiating with rebels to release 12 nuns seized earlier this month from the Monastery of Saint Tecla in the village of Maloula, north of Damascus. Rebels belonging to the al-Habib al-Moustafa are reported to be demanding the release of hundreds of imprisoned women activists in exchange for the nuns. The nuns were seized from their monastery on 6 December when rebels overran the area. Another three women were also seized from the convent’s orphanage. According to UCAN, they were taken to the nearby rebel-held town of Yabroud. Some of the fifteen women appeared on a video days after their capture saying they were alive and well. The identity of the rebels behind the capture of the group remains unclear. Church officials have said the al-Qaeda linked group Jabhat al-Nusra, or the Nusra Front, is holding them. The kidnapping of the women has strengthened fears among Syria’s minority Christians that al-Qaeda linked militants, who are increasingly prominent in rebel ranks, are targeting them. Meanwhile, government-backed troops have been blamed for the killing of at least 76 Syrians, including 28 children, in a weekend attack on the city of Aleppo. Separately, the Christian village of Kanayé, near the Orontes River, is reported to have been invaded by Islamist militants who are now threatening a massacre and to impose Islamic law. Mgr Giuseppe Nazzaro, vicar emeritus of Aleppo, received reports from Christians in Aleppo. On Monday, the United Nations launched the biggest aid appeal in its history, when it called for more than €4.7bn towards humanitarian relief for the crisis in Syria. That level of aid is needed in order to avert what the UN says is the greatest humanitarian catastrophe of modern times. Despite almost three years of conflict, there appears to be no end in sight to Syria’s war. The UN said the impact had “exceeded all previous benchmarks”. In the past two and half years of conflict, 2.4 million Syrians (more than a tenth of the population) have fled to the country’s five regional neighbours: Lebanon, Jordan, Turkey, Iraq and Egypt. 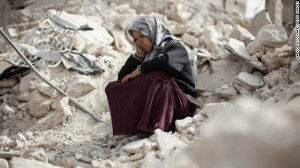 So far, almost half the Syrian population has been left destitute or homeless . A similar number do not have sufficient food, according to the Word Food Programme. At a meeting of donors in Geneva, the UN emergency relief coordinator, Valerie Amos said the Syria appeal accounts for half of a total funding plan and is the largest UN appeal ever for a single crisis. “The increasing number of internally displaced people and refugees is generating greater needs across all sectors and straining the capacities of neighbouring countries, with profound regional consequences,” the UN appeal said. Baroness Amos said most Syrians “think the world has forgotten them”.